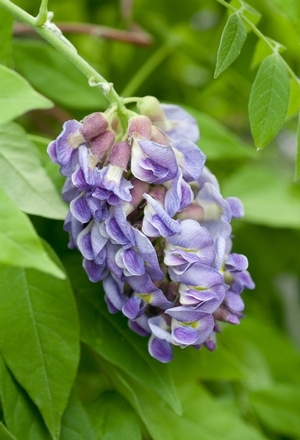 $12.50/gal, $15/container for "amethyst falls"
Wisteria frutescens (American Wisteria) is a woody, deciduous, perennial climbing vine of the pea (Fabaceae) family. It is native to the wet forests and stream banks of the southeastern United States, and is much less agressive than it's cousin, the Japanese wisteria. We carry the species and the variety, 'amethyst falls', which is ideal for for more constrained spaces. Delicately fragrant purple racemes bloom early even on young plants. good in containers for porches or patios, as an espalier, trellis, or trained on an arbor.